The ball mount hitch is the most basic way to connect a trailer for towing, It provides no sway compensation, weight distribution, or assistance of any kind. Due to its basic nature Ball Mount Hitches are very economical, with a typical price well under $100. However without any of the features found of more expensive hitches, towing a travel trailer on the ball can be exhausting, particularly in high winds or when your travel trailer is very close to the towing capacity of your vehicle. Weight distribution hitches, like their name suggests, help to distribute the tongue weight of your travel trailer. 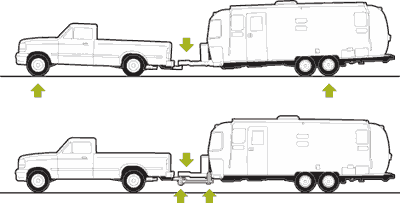 Without a weight distribution hitch travel trailers with a high tongue weight can cause the rear of the tow vehicle to squat. While this seems like a perfectly normal situation, in situations of extreme maneuvering, acceleration, or braking it can be hazardous. Removing some of the force usually applied to the steering wheels of your tow vehicle can make the handling unpredictable. Fortunately this is where a weight distribution hitch can help. 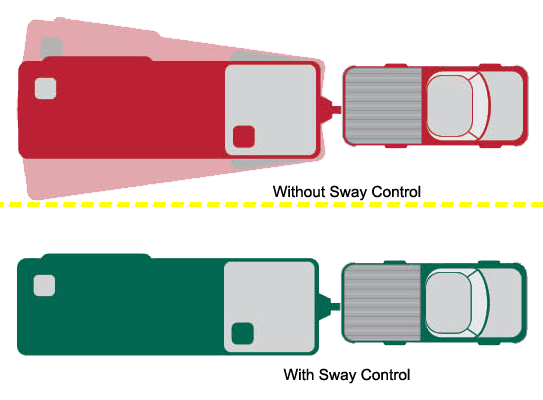 By using multiple points of contact, weight distribution hitches reduce the amount of weight applied directly at the hitch point. The end result is a level truck/trailer combo that keeps all wheels firmly on the ground, helping to keep the driving experience as safe and predictable as possible. Weight Distribution Hitches, help to equalize the weight of the trailer across all axles allowing for a better towing experience. Sway control hitches employ a variety of methods to prevent to your travel trailer from swaying while it is being towed. Be it the simple friction sway or any the more complicated multi-point sway control solutions all sway control hitches will help to reduce and in some cases eliminate the effects of crosswinds and passing vehicles. These economical and effective sway control solutions use metal on metal friction to reduce the effects of crosswinds and passing vehicles. The only major drawback with the friction sway, as compared to the more expensive multi-point sway controls, is the need to disconnect the sway for extreme maneuvering and backing, is most cases reversing with the friction sway attached will require the friction sway arm to be replaced. A weight distribution hitch with friction sway will usually cost $50-$100 more than a weight distribution hitch without sway. The Reese® Weight Distribution w/Sway is example of the Weight Distribution Hitch with Friction Sway. There any multitudes of multi-point sway hitches on the market, starting around $650 installed and stretching well beyond $2,000 plus installation. These hitches employ chains, pulleys, hydraulic pistons, frame add-ons, and in some cases complete the replace the coupler on your travel trailer. While they vary in complexity and cost, they all provide enhanced weight distribution and sway control as compared to the alternatives of towing on the ball and a weight distribution with friction sway setup. The Blue Ox SwayPro weight distribution hitch is an economical example of at multi-point sway control hitch. Sway control hitches provide additional trailer control beyond that of a traditional weight distribution hitch. Despite advanced hitching systems making it easier to tow a heavy travel trailer, it is very important to consult your tow vehicle’s manual for the maximum capacity, as well as maximum tongue weight. When reviewing these numbers keep in mind that passengers, gear and anything else stored in the bed or cargo area of your tow vehicle should also be counted towards your maximum capacity. Next week: A few words on fifth wheel hitches, short box trucks, and gooseneck adapters.